For one obsessed suitor, death and decaying flesh couldn’t keep him from his one true sweetheart. America has long been the land of fulfilling one’s hopes and dreams. 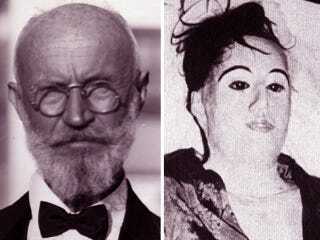 Or visions, as was the case of a German transplant by the name of Carl Tanzler. Tanzler emigrated to Zephyrillis, Florida — his wife and two daughters accompanying him later — only for him to leave his family soon after. He relocated to the Key West island, was hired as an X-ray tech at the U.S. Marine Hospital, and went by the name of Carl von Cosel (sometimes adding Count to his name). One day in 1930, Tanzler’s uneventful life was given new meaning. He was in his fifties at the time when he set eyes on the patient Maria Elena Milagro de Hoyos. Elena was sick with Tuberculosis and her mother brought her to the hospital to seek treatment. As a child in Germany, Tanzler reported visions of an exotic beauty, his one true love revealed to him by an ancestral relative. Tanzler knew that this dark-haired 21-year-old Cuban-American was his true love — in the flesh. Despite Tanzler’s lack of medical training and the disease’s poor prognosis, he took it upon himself to court Elena with an assembly of diagnostic X-ray equipment brought to her parents’ home, curative concoctions, presents of jewelry and clothing, and of course, professions of his undying love. Elena ultimately succumbed to her illness and died on October 25, 1931. The seemingly noble Tanzler paid for her funeral and built a mausoleum for Helen in the Key West Cemetery — all with the family’s approval. He spent almost every night visiting her tomb for the next one-and-a-half years. But soon Tanzler’s obsession with Elena turned macabre. He reported that her spirit would sing to him in Spanish as he sat at her tomb, and begged him to take her away. In April of 1933, Tanzler secretly stole her decaying body and wheeled it to his home in a toy wagon. He became dedicated to preserving her corpse in unimaginable ways. He held her bones together with coat hangers and wire, placed glass eyes in the eye sockets, and replaced rotting flesh with silk cloth treated with wax and plaster of paris. Tanzler stuffed rags in the abdominal and chest cavities to maintain the illusion of the human form. The corpse was outfitted with a wig (made of Elena’s real hair collected by her mother and given to Tanzler at her death), clothing, jewelry, and accessories. Oh, and the smell? Tanzler used bottles and bottles of perfume to hide the odor, and preservatives such as formaldehyde to delay the decomposition. He spent days with the dead body, sometimes dancing with it, and lay with it each night in his bed, possibly practicing necrophilia — he had even inserted a paper tube into the vaginal cavity. After seven long years, the disturbing rumors began to reach the family. Elena’s sister Florinda confronted Tanzler at his home and to her horror, discovered her sister’s preserved corpse in his possession. She called the authorities, and Tanzler was arrested and detained for the crime of grave robbing. During a preliminary hearing the case was dropped because the statute of limitations had expired. Tanzler was a free man. The corpse was examined by pathologists and physicians and because of its unique state, it was placed on public display at the Dean-Lopez Funeral Home. More than 6,000 people came to view the disturbing wax-like features of the corpse. The case garnered plenty of media attention from paparazzi and newspapers including Key West Citizen and Miami Herald. What’s more, the public tended to sympathize with Tanzler and thought of him more as a lovestruck eccentric than horrific recluse. After the spectacle that was the viewing, Elena’s corpse was eventually returned to Key West Cemetery, to an unmarked grave, where it was finally able to rest in peace. As for Tanzler, the rumored necrophiliac moved to Pasco County, Florida, in 1944. He wrote an autobiography which was published in the pulp publication Fantastic Adventures. His estranged wife supported him toward the end of his life and he even received his U.S. citizenship around that time. Still enamored with Elena, Tanzler created a plaster cast (or death mask) of her face, which was part of a life-size sculpture created in her likeness. He died in 1952, and was found lying on the floor almost a month after his death, reportedly wrapped in the arms of the effigy. For one (morbid) American immigrant, dreams did come true. This article by Stephanie Almazan originally appeared on The Lineup. It has been republished with permission.